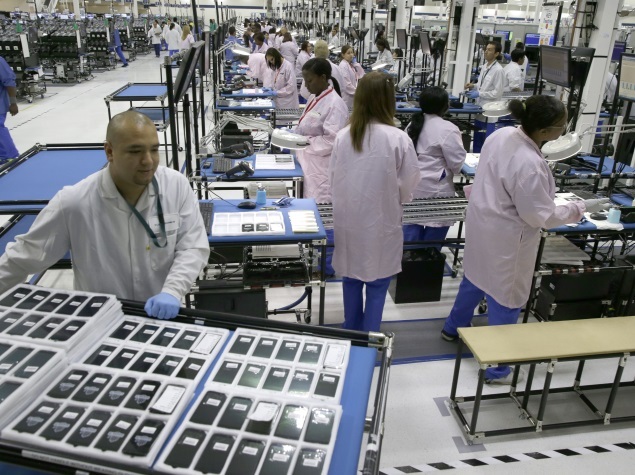 Nearly one-third of the 350,000 workers in Malaysia's electronics manufacturing sector -- a major supplier for leading global brands -- suffer labour conditions akin to "modern slavery", a report released Wednesday said. The study by US-based fair-labour organisation Verite said at least 28 percent of workers toiling in Malaysian electronics factories -- particularly foreign migrants from impoverished nearby countries -- were stuck in a spiral of indentured servitude, unable to pay off excessive recruitment fees. Verite said the study was commissioned by the US government, which bans the import of goods made with forced labour. Forced labour was found "in significant numbers across all major producing regions, electronics products, foreign worker nationalities, and among both female and male workers", said the report, based on interviews with 501 electronics workers across the country. "These results suggest that forced labour is present in the Malaysian electronics industry in more than isolated incidents, and can indeed be characterised as widespread." Malaysia's electronics manufacturing sector is a linchpin of the economy, and a key global supplier, producing semiconductors, computer peripherals, consumer electronics, communications equipment and a vast array of other products and components. It supplies major global brands such as Apple, Samsung, Sony and a host of others. The report did not single out any companies. But the sector's success rests in part on the backs of impoverished and vulnerable foreign workers from countries led by Indonesia, Nepal, India, Vietnam, Bangladesh and Burma, the Verite report said. It said its assessment of the problem was likely "conservative" and "should be understood as a minimum estimate". Verite said a key factor in the exploitation was the prevalence of recruitment fees paid by workers, who typically go into debt to pay them. The fees, charged both in workers' home countries and in Malaysia, "often exceeded legal and industry standards equivalent to one month’s wage", it said. Recruits were often deceived about working conditions, salary levels, and terms for opting out of jobs. They often struggled to repay debts and faced new charges for leaving jobs early, the report added. Many said they felt pressured to work overtime, and 38 percent of foreign workers reported being forced to sleep in cramped rooms with more than eight people, their movements restricted. Ninety-four percent of foreign workers said they had to surrender their passports, and 71 percent of those said they found it impossible to get them back. "Keeping our passports shows nothing more or less than modern slavery," the report quoted a male Burmese interviewee as saying. Officials with Malaysia's government and main manufacturers' association were not immediately available for comment. Malaysia is relatively prosperous compared to its neighbours but is often criticised by labour groups for failing to adequately ensure the welfare of its estimated two to four million foreign workers.